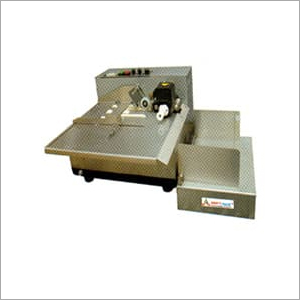 We provide precisely constructed dry ink batch coder, which can be termed as the particular label printing equipment, ideal to print the labels onto the surfaces like aluminum foil, paper, and nonferrous plastic film. We anticipate the future requirements in this field of work and hence, we always stay ahead in the market by delivering the top grade, high performance, and easy maintenance batch coders. These adopt the working mechanism of cantilever type and are very accurate in performance. The printing done with this machine is clear and it is not simple to change or erase it. We are considered as a giant company in the business of fabricating dry ink batch coder and so, we conduct incessant research activities. This allows us to eliminate any disruption in the production process and hence deliver the sturdily packed coders to clients.